Yellowfin Tuna fishing in Puerto Vallarta. 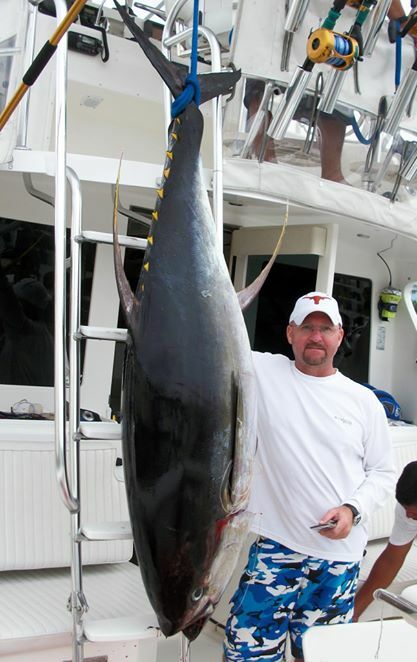 The Largest Yellowfin Tuna ever caught was in Puerto Vallarta in 2013 429 lbs the average Puerto Vallarta Yellowfin tuna is between 100-300 lbs. The Puerto Vallarta Tuna fishing grounds is always offshore in high season September and October you can normally find these monster fish at La Corbetena or El banco the rest of the year you normally need to travel even further offshore 80-120 miles on our over night Puerto Vallarta Tuna fishing trips these types of charters are for serious anglers that have been offshore fishing before. there are few different techniques our captains use when fishing to Tuna you can troll with live bait goggle eyes, or bigger skip jacks, or lures. casting live bait or jigs for smaller tuna, drifting with live baits, also using kites and balloons trolling and drifting.